Last week I was in Hampton, Virginia at the Mid Atlantic Quilt Festival working with Deb Tucker in the Studio 180 Design booth. We were busier than a one armed paper hanger! I felt so fortunate to see so many of my friends. When I first arrived I had time to chat with my friend Paula Harr. I met Paula about 5 years ago through the Tidewater Quilt Guild in Virginia Beach, VA. I liked her immediately. She has a wicked sense of humor and a sparkle in her eyes that can light up a room. Paula was raised by her grandmother and as a child played under the quilt frame as quilts were made by hand. 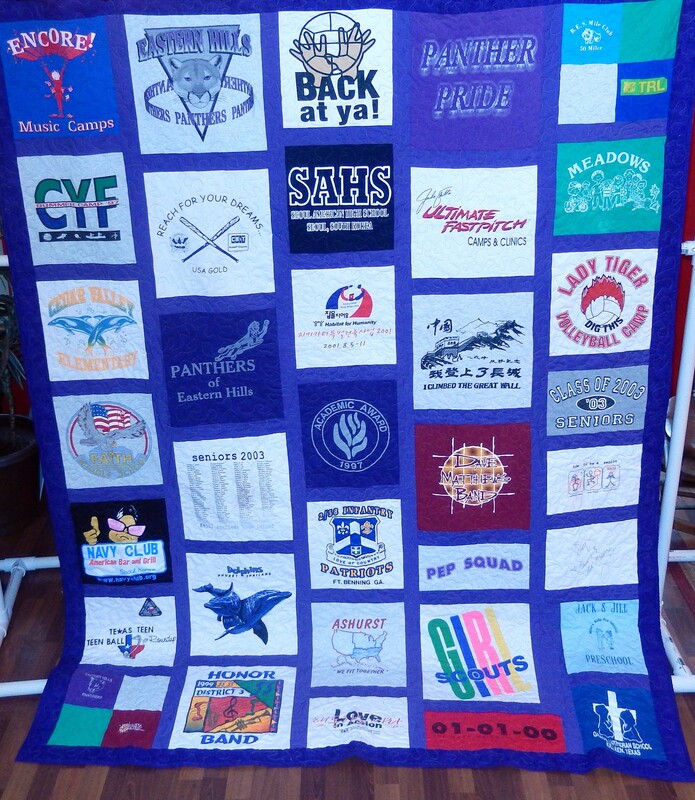 Paula has been quilting since the 1980’s. She owned a quilt shop in Fairmont, West Virginia called “Uncle Bertie’s”! I asked questioningly “Uncle Bertie’s”???? Paula replied that for some unknown reason her children called their Great Grandmother “Uncle Bertie” and there you have it! Paula was a Psychiatric Nurse for 47 years; I think that explains the twinkle in her eyes! She retired on a Friday the 13th in 2014 just for luck! 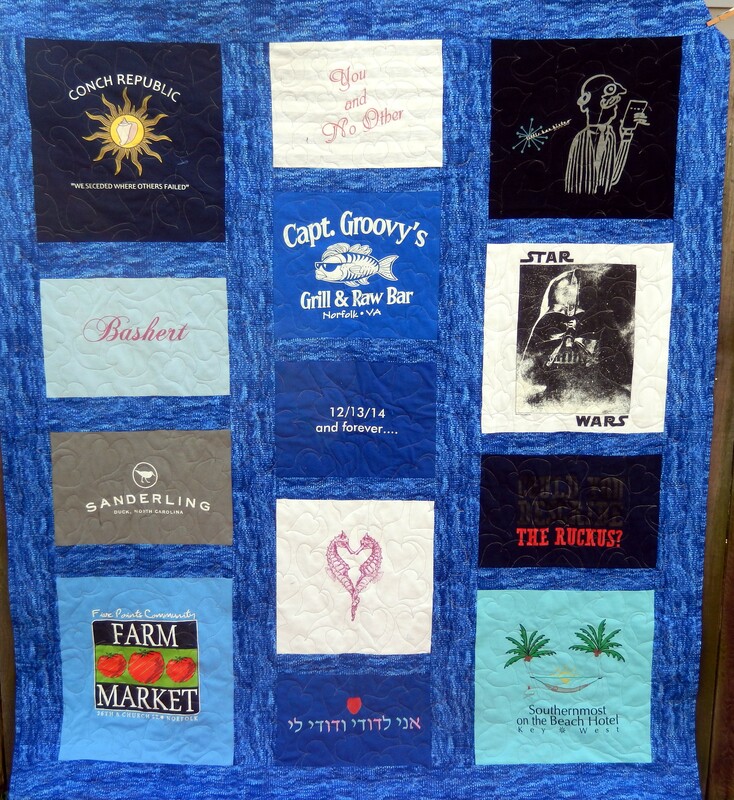 Several Years ago Paula was approached by the Neptune Festival Committee in Virginia Beach, and asked if she would make them a T-shirt quilt to raffle as a fund raiser in exchange for a free booth at the fair, she said yes and a new business was born. 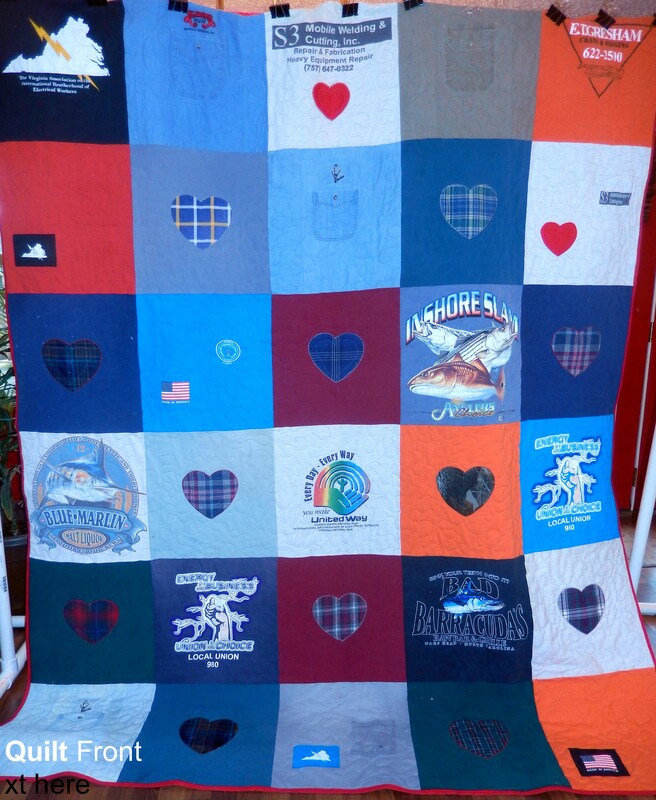 Below is the gorgeous quilt she made for the festival. 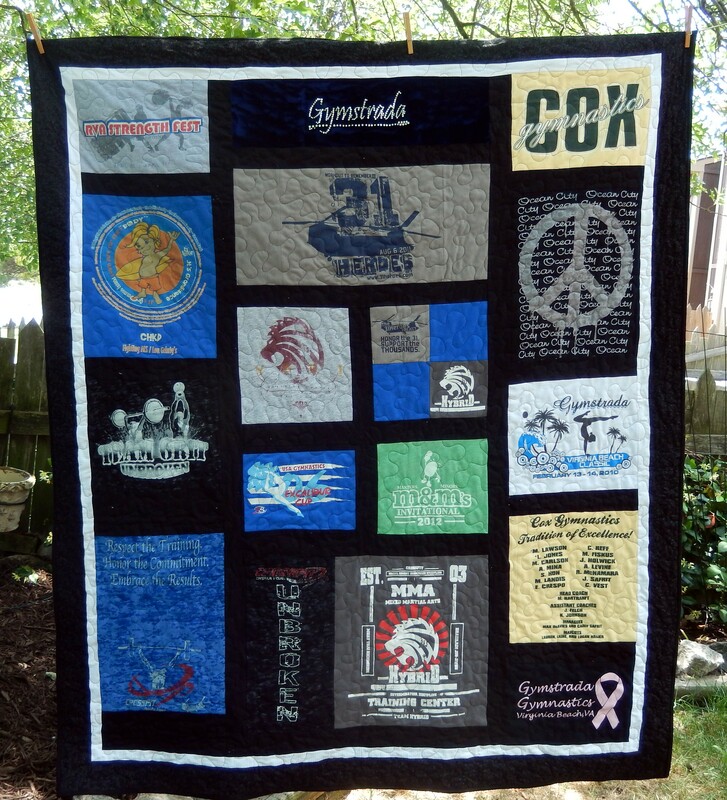 Paula says “every quilt tells a story”, and she so enjoys meeting the people, hearing their story, creating a T-Shirt Quilt that captures their story and their most cherished memories. 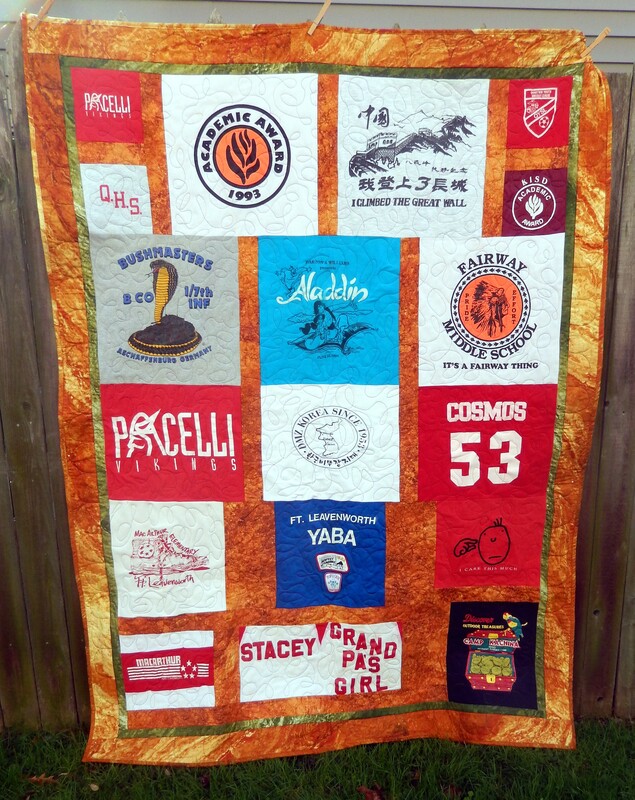 She has made so many that she now has one hour quilt guild presentation on making T-shirt and Memory quilts. 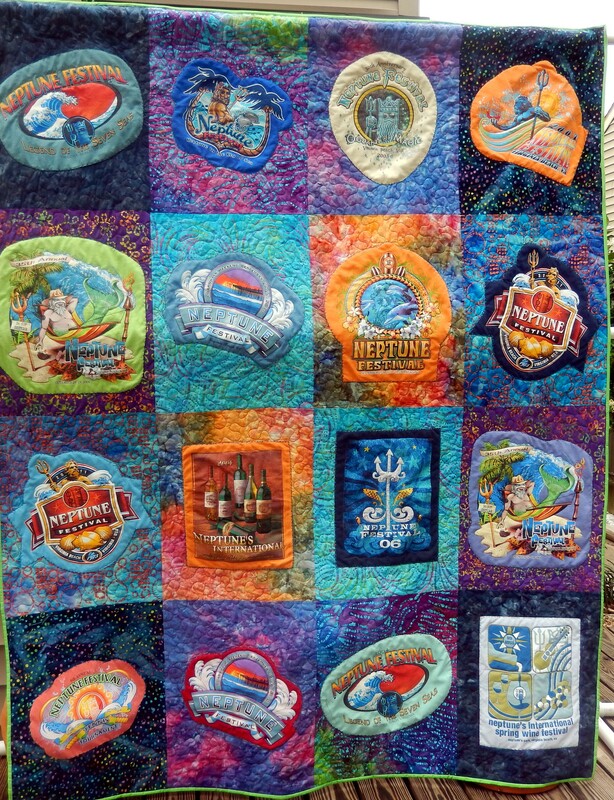 This entry was posted in Quilt Friends and tagged Memory Quilts, quilting, Quilts, T-shirt Quilts on March 4, 2015 by ifthesethreadscouldtalk.